Needlework Around the Traps – Learn Something New in 2013! The start of a new year often involves resolutions to learn something new, or to do something different during the course of the new year. Here are four needlework possibilities that you might want to explore, if you’re itching for some new direction in needlework for the upcoming year. The first possibility: how about learning how to combine paint and embroidery in a landscape? Margaret Vant Erve is a needlework / textile artist from Canada who specializes in embroidered and mixed-media landscapes. I love her work! Her landscapes are beautiful! They remind me of … well, ok. They remind me of Kansas. I suppose most people wouldn’t take that as a compliment! But there are some beautiful spots in Kansas, and Margaret’s open fields and farmy landscapes smack of home to me. I like the cows (actually, I think they’re bulls), and they way they look at you. 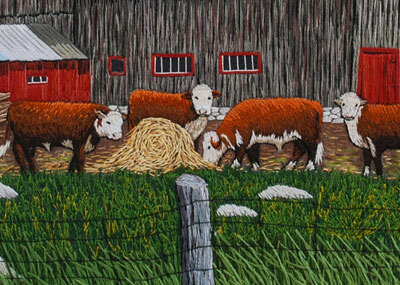 Margaret’s teaching an online class in landscape embroidery through CraftArtEdu, called Meadow Landscape. The class consists of video lessons and 2 downloadable PDFs. You receive a class handout (a PDF that takes you step-by-step through the project) and a PDF of the sketched pattern for the meadow landscape, along with access to five videos that range anywhere from about 10 minutes to 25 minutes each. You supply the materials. I haven’t had a chance to look at the class content in-depth yet, but from what I have seen, it looks good – like a good starting point for this type of textile art. If it’s something that snags your interest, you might look it up. It’s definitely a class for those interested in combining painting (on silk) and embroidery in a landscape. Second Possibility: Give needlepainting a try! 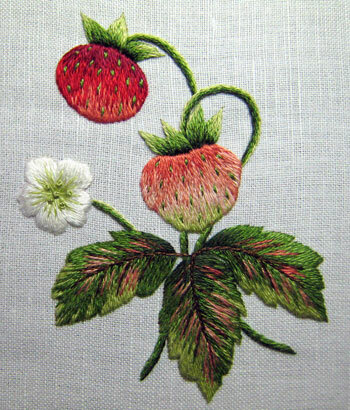 If you’ve been embroidering for at least a little while and you want to learn needlepainting or advance your shading and color skills a little bit, here on Needle ‘n Thread, we’ll be running the Vintage Strawberries class again early this year. I’ll be announcing the details close to mid-month. The class will probably sell out very quickly, so I will let you know in advance exactly when opening registration will be announced, so you can get your foot in the door if you want to take the class! Look for that information later this month! Third possibility: Embroider a bear! So you’ve been learning needlepainting and you’ve conquered flowers a bit, and now you want to try something a little more robust? 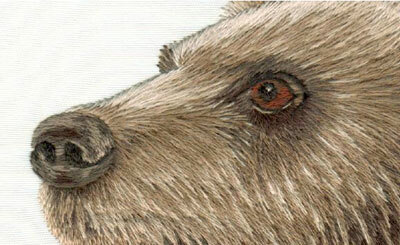 You might check out Tanja Berlin’s new Grizzly Bear needlepainting kit. In fact, if you’re itching to try a new embroidery technique this year and you want to start with a good kit, I highly recommend any of Tanja’s embroidery kits. They are well-written, thorough, and they include everything you need to work the project (aside from hoop or frame and scissors). She has whitework kits, goldwork kits, blackwork kits, Jacobean kits, needlepainting kits, shadow work kits…. there’s lots to choose from! Fourth Possibility: Whitework!! You love whitework? You love Schwalm whitework and white-on-white folk embroidery in general? You might think about checking out Luzine Happel’s new Schwalm books. Yes, they just keep coming! Luzine is a prolific writer about Schwalm embroidery, and I reckon if you make your way through her books, you’ll be an expert by the end of the journey! Luzine has two new books out – Schwalm Crowns and Grand Schwalm Crowns. 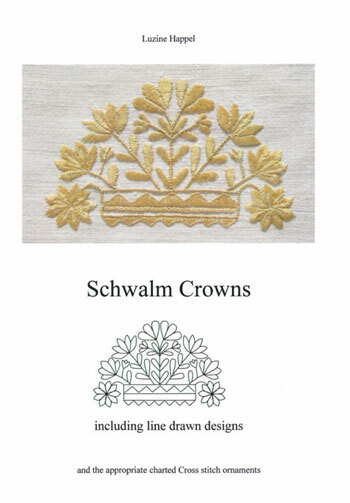 Both books are packed with line drawings for “crown” designs in Schwalm whitework. Luzine’s books are self-published, spiral bound books packed full of good information and patterns. If Schwalm whitework strikes a cord with you, but you don’t know where to start, feel free to read my review of Luzine’s book, Basic Principles of Schwalm Whitework. This book is a great starting point! So, what about you? Do you have any new needlework plans for 2013? Are you going to try something different? Explore a new technique? Start a big, new project? If you could learn any technique you wanted to this year, what would it be? Is there any specific technique you’d like to see available as an online class here on Needle ‘n Thread? Leave a comment below! Iam always looking for something different to learn but some things just do not turn my crank. I’m looking at maybe trying Tanya Berlins Blackwork Horses. They look very interesting and the technique looks interesting to do. I also will try and do the painted robin that I bought from her. Oh and finish my needlepoint Kimono that I’m working on. But there is so much to learn out there and little time to do it. Have a great day everyone and keep on stitching. I can’t recommend Margaret Vant Erve’s classes highly enough!!!!! Her work is beautiful and she’s a great teacher. I’ve taken 2 of her classes and would do so again if life permitted at the moment. I already have so many projects in my queue that I’ll need to live another 65 years to finish them all. And then you tempt me with new things. Margaret Vant Erve’s work is lovely and will go on my bucket list. This year I am trying stump work. I have the pattern ( from Inspirations #67) and the threads, but I was too much of a chicken to try last year. I have done a little bit of stump work and a little bit of detached buttonhole, but this is a lot of stump work and detached buttonhole. I’m excited about it! Fabric (xyz are on one chart.) Have a happy stitching New Year, I am! Our EGA is having a NBS contest this year.NBS – Never Been Started. We make a list of what we want to do this year out of our stash. Then points will be given for completed projects. I have a whole basket full! PS: I made the basket at a workshop this summer and I am so thrilled with it! Paint & Embroidery landscapes look lovely and I’m so glad you will be setting up an online course on needlepainting. One of my projects this year is to look into portrait embroidery in fact my current project in needlework is the Guardian Angel by Galina Tregubov which was a free download which you wrote about on one of your blogs in 2012 it will get me started on portrait embroidery. This is so exciting. I plan to try painting and needlepoint/ embroidering on my next project. Love your daily emails and information. I really want to experiment with different types and weights of threads. I’m interested in 3D embroidery of all types. I want to give some depth to my scenes. I love whitework and would love to do some this year. I’ll definitely check out Luzine’s books. For my first project I’d like to make a nice Christening style gown for our nativity scene baby Jesus incorporating some whitework. He’s only six inches tall so I’m thinking it’s a good project to incorporate some fancier stitches without having to worry that I’ll never finish. Ah, goals and resolutions… Yes, I have some and hope to get to do at least a fraction of all the things I want to. More ideas than time and money (because most things require shopping for supplies and I’m on a tight budget as always). I’m doing the Bead Journal Project this year, which I hope will give me the incentive to play around with beads and mixed media embroidery, trying different ways of combining bead embroidery and thread embroidery. And I’m trying to keep up with TAST, which will continue this year. Stitching and beading on canvas would be so fun to try. I do like linen canvases, even if they’re more expensive than the more common white ones, and they’d probably make beautiful backgrounds. Also, I’m specifically hoping to give bollsöm a go. Unfortunately I haven’t found a great source for it yet. The basic instructions, yes, but it’s a bit tricky for me to find the right type and amount of thread to use, what scale to work in etc. Will also be trying anundsjöstygn (sometimes called swedish split stitch in english), even if it’s not a favourite yet. It’s fun to play with old stitches, especially ones that aren’t as wellknown and which you don’t find in all the online stitch dictionaries and basic tutorials. OK…….we are definately linked in some mysterious way. As we all do in January I have been thinking about what new media I want to try (this is the perfect joy of retirement!) and I have seriously, for many years, wanted to try landscape needleart in a mixed media….yes really!!! I live in rural North Florida on the Suwannee River and you would not even begin to imagine the beautiful creations I can see. AND then this morning, I open your blog and I see the utterly awesome work of Margaret Vant Erve, who I had never heard of before, and we CLICKED. I will take my little Christmas money, add to it and take her course. Thank you so much for always being my inspiration and my friend (if only on the Internet). …and I forgot to say how fab Margaret Vant Erde’s landscapes are! Very beautiful and inspiring! Sorry for a second comment. 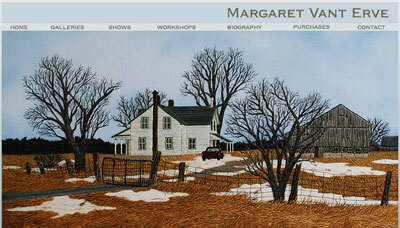 I love learning that where you live in Kansas is similar to Margaret’s work. As I child I lived in southern Ontario and I instantly recognized the type of landscapes she does. In fact I have a nephew who still lives there who is a professional artist and he does rural paintings with the same verve!! Also with the idea of developing something new every year, last year I took the leap and began working on redwork portraits (from photographs) that I made for family and friends. They were such fun to complete and a new use of an old needleart (and they were very appreciated too!). Many years ago, I started a hardanger table cover. My goal this year is to continue the work on this project. Not sure why I abandoned it, perhaps because it is a difficult piece. Hmmm. I may not finish it this year, but I want to continue the work. I would love to try needlepainting. I love the designs and the delicacy of the work. Right now I am immersed,and I do mean immersed, in working on my Kaffe Fassett needlepoint rug. I love doing it and will be posting some photos of my progress on Stitchin Fingers so everyone can cheer me on when I get discouraged (or bored). Happy New Year to Mary and all my fellow stichin fanatics. I love reading your information about needlework. I am interested in trying embroidery needle painting. I love to learn new techniques of needlework. I am still a novice cross-stitcher at this time. Hi again from Ottawa – Margaret’s work is indeed wonderful and lovely to see her get exposure from your site. She does a lot of work from scenes at the (National) Experimental Farm. It is a farm that was on the outskirts of Ottawa but is now more centered – a lovely area to wander through and drive by on a busy day. My list for this year is Hedebo project(s), finish what I have started and maybe some more machine embroidery, and then tackle my Tanya kits….and and and – need to retire for more stitching time ! Happy newyear. I really can’t decide coz i’m greedy, to learn everything there is in embroidery but since i’m new to white work i think i’ll find it interesting to learn it. I am surrounded by them all in my sewing room. I have never been able to use transfer pencils. Do I need to use tissue paper or should light weight computer paper work? I think that process makes me stop at some of the most beautiful designs – before I even get started!! Of course, there are always the iron on patterns, but that is so limiting. Yes, those are bulls in the picture. Bulls have one “thing” hanging down in the middle. Cows have four “things” hanging down towards the back end, and they are usually pink. And a steer is a castrated bull. I don’t know how to tell bulls and steers apart by looking. Usually a farmer has only one bull, but not always. Right now, my embroidery plans are to attack some of the kits I have bought in the past year. They are not full kits, just the pattern and the thread pack (so I don’t have to go hunting all over for the types of thread, or use just DMC for the whole project). I have just purchased Luzine’s Schwalm Crowns book. The book is filled with wonderful designs and great photos. There is a section in the back with cross stitched motifs suitable to sign and date a project. The crowns are shown stitched in a beautiful gold colored stranded cotton. I can’t wait to start stitching one of the designs. This year I will start Carolyn Pearse Dolls House workbox. I believe it will take 2 years as I am not quick but am itching to get on with it. still have a very small amount to do with last years project. Thanks Mary for keeping me entertained for the year. On January 3 I’m starting an online apprenticeship to learn the traditional method of creating Tibetan Buddhist Thangkas. This is a kind of groundless applique work where each piece is stitched to the next and all the pieces support one another. I saw the presentation of her work. Its exquisite. The colours, details and the neatness of her work. I took my first embroidery class in Sept. and feel comfortable with the basic stitches. Now I want to expand my horizons but not sure what to tackle next. I love your expertise and am learning new things everyday (well, almost everyday). I will be starting my all-time dream project this year! I signed up for Thistle Threads’ Cabinet of Curiosities project in the early hours of this morning. I’ve loved needlework caskets since I first saw them on the UK Antiques Roadshow years ago. Between now and starting in May, I’ll be dreaming up a suitably Antipodean theme for my casket. Trying not to think about all the unfinished projects already living in my sewing room!! I have enjoyed todays newsletter. I would love to try Margarets scenes and your thread painting, however alas I have 8 major unfinished projects on the go and 2013 is the year to finish as many as I can. I am semi retired and hope with more time up my sleeve I can can stitch and stitch. The plan is at least 2 mornings a week I will get up and begin stitching immeadiately after breakfast until lunch time, by then my eyes will be tired and I will need to move, so the afternoon will be for other jobs, gardening and shopping and 5then back to stitching again in the evenings. This is a hint I learntfrom Phillipa Turnbull, no waiting until you get your jobs that never happens there is always something else to do, so stitching comes 1st abd everything else will fall into place. Maybe next year I will consider some on line classes, but my wips (works in progress) all of them worthy projects must get finished or at least a look in this year. Happy New Year to you Mary and yours, also to your wider group family. This year I am hoping to finish many jobs that I went off, for one reason or another. Really not like me as I am more a pick it out and get it right person. Must be old age and the hand niggles puting me off. I would liked to have joined in the Strawberry sew in but I thought before I saw your sew along I would get Tanja’s Field Mouse. It is so cute and she is such a delightful young woman who I have dealt with before, (from your reference I might add)that I will do so again. Like you she is so very helpful and knows her “stuff”. Can’t say I want to try anything new in sewing this year but I do intend to take wall paper off the walls. Never done that before, but I will be glad to see the rotten stuff go. Have a wonderful, happy year my dear and I hope that for all. Thank you soo much for sharing Margaret’s work. Yes, those fields do look like Kansas, and that’s wonderful – just like Kansas! My 2013 plans are to forge ahead with my Cabinet of Curiosities project through Tricia Nguyen’s Thistle Threads. It’s a huge 18 mo. course on 17th c. Stuart Embroidery – I’m having the time of my life and hoping to make piece worthy of the subject. Happy New Year Mary! 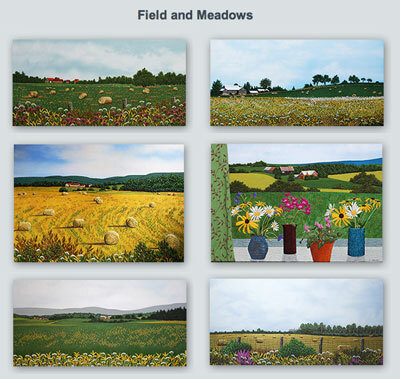 Love Margaret’s landscapes they are gorgeous – thanks for keeping us informed and hope that 2013 is great for you. I may have a go at blackwork and a Nordic technique called ‘Liina’. A former Finnish contact sent me a kit to work. Shading is just so hard. I make a decent job of it, but I find it just so difficult! I’m working on a rabbit at the moment and I have to force myself to get going as it’s so challenging. Shading is just not my forte. Hi Mary. Thanks again for your great website. I have two new challenges for 2013. First, a stitching group in Florence,Italy, has issued a challenge for needle and thread pieces inspired by the Palazzo Davanzati and the bedchamber theme of the story of the Chatelaine of Virgy. I am going to use the many graphic elements in the Palazzo and my computer to create a piece,stitch it, and enter it to see if they will include it in a show in December. I am a novice but eager to try a new needlepoint.. Check out the website. The needlework there is amazing. I am also learning Punto Bandera, an embroidery of the Piedmont region of Italy. My daughter lives there now and has introduced me to some people there who teach classes. So I hope to get back there and start learning! More on that some other time. What does “around the traps” mean? Good point! I use it for “around different places” or “in various places”…. Would like to embroider 4 tablecloths for each of my grown children and at least start 4 quilts or quilt projects as I have not done quilting before. I would just like to work at getting better at embroidery in general. Practice makes perfect. On your home page is a picture of a purple flower with gold and green leaves. Part of the leaf stands off the fabric. Do you have a video of this stitch? Or can you tell me how this is done? I hope this is a clear explanation of my question. I think your website is great and your videos are the best. Thank you for the time you take to share your talents. Your Vintage Strawberries are really lovely. Looking forward to seeing more details about them. One technique that I’m hoping to explore this year is tambour embroidery. I’ve purchased a hook from Lacis but have never seen anyone use one. I’ve seen some instructions in old needlework books but can’t seem to get the hang of it. I understand this technique was once quite popular (in the early 1800’s?). Do you know of any videos showing how it’s done or would you be interested in doing one? Love your how to videos. I decided to try out Tanja’s “Baby Burrowing Owl” needlepainting kit. It is a fun experience for me and something new since I am an avid cross-stitcher person. I have received the kit and looking forward to working on it. Previous Previous post: Needle ‘n Thread – Backward & Forward!